When it comes to juicing, there are basically two types of juice machines that are available for you to choose from. You can choose from centrifugal juice machines or masticating juicers. Centrifugal means moving or directed away from a center or axis. Your teeth are an excellent example of mastication in action. Your teeth chew and grind food. After you swallow, the food then goes to your digestive system which, through the process of digestion, begins to extract the juice from the food you eat. Much in the same way, a masticating juicer grinds vegetables and literally squishes out the juice. Since a masticating juicer works at low speeds and with no spinning action, it tends to juice many vegetables more efficiently. The difference between a centrifugal juicer and a masticating juicer is like night and day. Centrifugal juicers work at high speeds, tend to be noisy and while a centrifugal juicer may be able to juice the rind of a pineapple more efficiently, in most situations, the low speed action of a masticating juicer allows you to juice more vegetables with greater efficiency. A masticating juicer tends to be a lot more quiet, less messy and easier to clean. A masticating juicer is especially good at juicing the very important green leafy vegetables such as wheatgrass, spinach, parsley, cilantro, kale, Swiss Chard, etc. 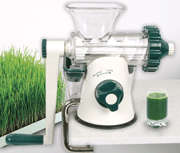 While a centrifugal juicer can juice green leafy vegetables, the centrifugal juicer is nowhere near as efficient as a masticating juicer in this regard. Some say the high speed action of a centrifugal juicer produces too much heat which then can damage or possibly kill the enzymes in the juice. While I can neither confirm nor deny this statement, one thing is for sure, a masticating juicer definitely does not create the friction that a centrifugal juicer will create. One significant benefit of a masticating juicer is that it requires less vegetables, in many situations, to create more juice. As a result, you spend less on vegetables than you would with a centrifugal juicer. It's also worth noting that a masticating juicer is much more versatile, in many regards, compared to a centrifugal juicer. Since a masticating juicer squeeze the items you put into it, you can also use a masticating juicer to make baby food, fresh pasta, grind meat and to make nut butter. In the past, I've always used a centrifugal juicer. This is primarily because back when I started juicing, this was the only type of juicer that was readily available. I was also really impressed with Jay Kordich, aka "The Juiceman", who was my first real introduction to juicing. So when I started juicing, I used a Juiceman Jr.
Today, my preference is to use a masticating juicer. I really enjoy the simplicity and versatility of a masticating juicer as mentioned above. I enjoy the ease of cleaning, the quality of the juice produced and I also really enjoy the fact that a masticating juicer is reasonably quiet. 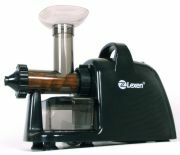 If you are interested in a masticating juicer, then consider the masticating juicers made by Lexen Products.